Get in touch now to see about our availability for your big day. Ceremony music can be adjusted to your preferences. It is very easy and convenient to contact The Secret Chord. If you wish to know about our services and musical options, simply reach out to us by email or phone. Caroline is always ready to answer any questions you might have or enquiries you might wish to make. We endeavour to respond as soon as possible to all requests. Please let us know as much detail as possible when you contact The Secret Chord as we are then able to provide better answers. Date of Ceremony, location and time if known will be key. Looking forward to entertaining you and your guests. The Secret Chord can provide music and songs to enhance your special day. The music and songs will enhance and personalise your wedding ceremony making memories that will last a lifetime. 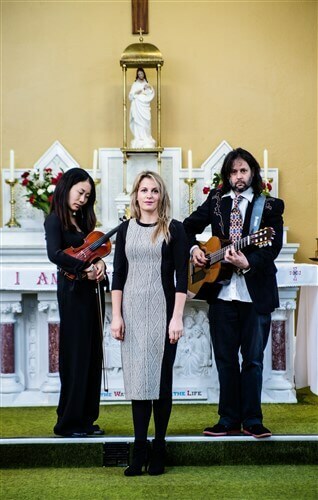 Yuki on violin, Quentin on guitar and Caroline on vocals. 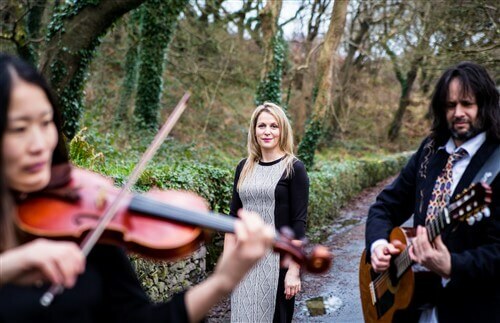 We specialise in wedding ceremony music specifically tailored to each couples personal style, from classical to ballads to jigs & reels! Below are some music we have recorded but don’t include our full repertoire. We cover church, humanist and civil ceremonies and are available for pre-dinner music at your reception.